The BBC National Orchestra of Wales (BBC NOW) is 90 this year and the orchestra has a range of celebratory activities from now until its birthday week in April. 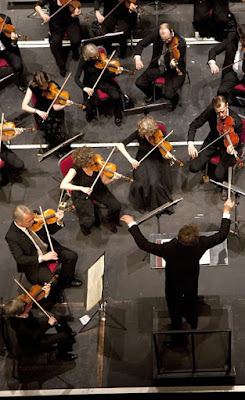 Next week, 24-26 January 2018 the orchestra is co-hosting the Association of British Orchestras (ABO) Conference in Cardiff with the orchestra of Welsh National Opera (WNO) and Sinfonia Cymru, and BBC NOW will be giving a joint concert with the WNO Orchestra. BBC NOW's current composer in association is Huw Watkins, and during January the orchestra premieres Watkins' Spring written in celebration of the orchestra's brithday, and a number of Watkins' other works are featured in the season. The orchestra has premiered over 100 new pieces in its 90 year history and in February the start of a new Digital Archive is launched, which will explore music written for and performed by BBC NOW. In a pair of concerts, BBC NOW will look back at music it has commissioned with music by former Composers-in-Association, Michael Berkeley, Simon Holt and B Tommy Andersson, and former Composers-in-Residence, Guto Puw and Mark Bowden. As part of Composition: Wales seven composers have been selected, Gareth Churchill, Iestyn Harding, Ian Lawson, Lucy McPhee, Claire Victoria Roberts, John Senter, and Luciano Williamson, and they will have the opportunity to workshop their pieces with the Orchestra in open rehearsals supported by conductor/composer B Tommy Andersson and mentored by Huw Watkins and Tansy Davies. During March, BBC NOW will be celebrating Wales with a series of concerts starting on St David's Day (1 March 2018) with a concert which includes world premiere of Gareth Glyn’s Harp Concerto (a Ty Cerdd commission) portraying scenes from the life of Saint David, the patron saint of Wales with harpist Catrin Finch, conducted by Grant Llewellyn. On Thursday 12 April BBC NOW turns 90. Throughout its birthday week from 9 – 15 April the Orchestra celebrates with the nation on air, online and in concert with a host of music, memories and festivities. Further information from the BBC NOW website.